Until October 2015, Italy welcomes the world to the Expo Milano 2015. No fewer than 144 countries present their ideas on “Feeding the Planet, Energy for Life” to some 20 million expected visitors. The focus is on the major future challenges of human nutrition. The exhibition invites visitors to think about how a balance can be achieved between the availability of resources and their consumption and how potential solutions can be found. Responsible use of resources is also one of GROHE’s focal topics. So it was a logical step for the organisers of the German Pavilion at the Milan World Exposition to ask the leading manufacturer of faucets and fittings to become a partner and equip the Pavilion with its water-efficient products. The German contribution “Fields of Ideas” is a sincere and authentic take on Expo’s main theme. The Pavilion provides an insight into new and surprising proposals from Germany on the food of the future and invites visitors to take action themselves. The German agricultural sector is presented as a strong, modern sector of the economy but also as an intrinsic aspect of its unique cultural landscape. The Pavilion shows a vibrant, fertile land full of ideas and solutions and presents Germany as open, warm, friendly and whimsical. The architecture of the exhibition area is reminiscent of open fields and farmlands – a building consisting of a gently sloping landscape level with a freely accessible surface and a thematic exhibition inside. In this landscape, with clearly discernible fields, stylised plants grow as "idea seedlings" up from the exhibition to the exterior surface, creating a large, protective canopy. The German Pavilion is welcoming and lively, uniquely reflects Germany's attitude towards environmental protection, and communicates its messages with authenticity. With a multifaceted spectrum of inspiration, interaction and participation, visitors to the Pavilion themselves become part of the large, vivid picture of Germany. Innovative technologies “made in Germany” can be found in every detail at the German Pavilion. The sanitary facilities, staff rooms and artists’ dressing rooms are equipped with GROHE products. These include, for instance, electronic Essence and Allure faucets which stand out not only thanks to their stylish design. They both use infrared technology to ensure that water flows only as long as the hands remain in the sensor area. Staff or artists using one of the showers at the German Pavilion can also save water simply by pressing the Eco button on the GROHE Rainshower® Icon showers, which will reduce water consumption by 40 percent. The GROHE actuation plates for the WCs and urinals are also equipped with volume limiters. Electronically controlled like the Tectron Skate or equipped with a dual-flush function like the Nova Cosmopolitan, they dispense only the amount of water that is actually needed. 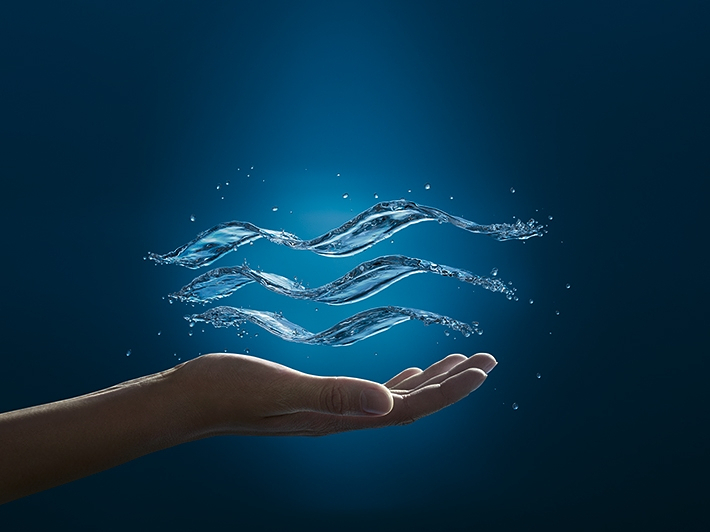 The GROHE Blue® water systems installed in the staff areas have also proven to be sustainable. They supply chilled and filtered still or sparkling water straight from the faucet. Among other things, this allows the carbon emissions arising when mineral water is bottled and transported to be reduced by up to 50 percent. In combination with GROHE Red®, which supplies boiling hot water from the faucet, the consumption of energy is additionally reduced, as tea, for instance, can be brewed without using electric kettles, which consume much more electricity than the GROHE Red® system. Innovative solutions for a responsible lifestyle make GROHE the ideal partner for ARGE Deutscher Pavillon at the Expo Milano 2015, where GROHE supports their exhibition concept with solutions for a sustainable future. On behalf of the German Federal Ministry of Economic Affairs and Energy, Messe Frankfurt has been entrusted with the organization and running of the German Pavilion at Expo 2015 in Milan. The design, planning and realization of the German Pavilion have been taken on by the ARGE, a consortium made up of Schmidhuber (Munich), Milla & Partner (Stuttgart) and Nüssli Deutschland (Roth near Nuremberg). Schmidhuber is responsible for the pavilion’s spatial concept, its architecture and general planning. Milla & Partner is responsible for the content concept as well as the design of the exhibition and media and Nüssli for project management and construction.